Because it wouldn't be Christmas without a ton of red glitter. 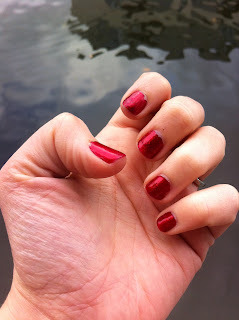 Those of you who are regular readers of my nail posts will know that I am a sucker for both a bright colour and a seasonal shade, so it only seemed logical that my polish in the run-up to Christmas I would opt for a polish that encapsulated both of those perfectly - China Glaze Ruby Pumps. As the name suggests, the polish was inspired by Dorothy from The Wizard of Oz; I didn't know this at the time but according to All Lacquered Up it's a recreation of a polish that was first launched in 2001 and which has been the subject of frenzied shopping and petitions to bring it back, but has since made it to China Glaze's main line. The bottle is a standard bell-shaped China Glaze bottle, which feels sturdy in the hand but equally looks sleek and glamorous. I've talked about China Glaze brushes before but I particularly like the long lids on these polishes which enable you to get a good grip on them - useful for the likes of me who is totally cack-handed when it comes to applying nail polish. When applied to the nail the polish basically does what it says on the tin - a lovely rich true ruby red with lots of dense fine glitter. Formula-wise it is a little on the sheer side, as glitter polishes often are; I could probably have got away with two coats but three made it lovely and opaque as well as allowing even more of that gorgeous glitter effect, and there were no visible brush marks. Durability is a bit weird, if I'm honest - I painted these on Sunday morning and by the time I got to work on Monday there was a huge chip in one of them, but the others are still going strong. I'm writing this on Wednesday, which is also when I took the photo, and as you can see there's a little bit of tip wear but so far no chipping otherwise, so I'm really impressed with that! Overall I really love this polish and think it's a fabulous classic red that would go with so many different looks and outfits, with good opacity and durability. The only downside is when/if you want to remove it you have to soak cotton wool in polish remover and then wrap your fingers in tinfoil like an alien, but for such a dense sparkly classic red glitter I can happily live with that. I can't recommend this enough as a polish for special occasions, the festive season or when you just want something pretty and shiny on your nails. If you'd like to try Ruby Pumps it's available at BeautyBay.com for £4.52 a bottle, or you can also get it at Amazon for £6.49.